Built by North American. Constructors Number 96-20806. Delivered to U. S. Army Air Force (USAAF) as B-25G-5 Mitchell serial number 96-20881. This B-25 was ferried overseas via Hickam Field to the Central Pacific. Assigned to the 7th Air Force, 41st Bombardment Group, 820th Bombardment Squadron. Nicknamed "Coral Princess" with the nose art of a woman wearing a hula skirt. A scoreboard with yellow bomb markings indicating combat missions flown and the siloette of a destroy (claimed off Wotje) was painted below the the left side of the cockpit. This B-25 flew at least 28 combat missions. When lost, engine and weapon serail numbers were not noted in Missing Air Crew Report 6575 (MACR 6575). On June 29, 1944 took off from Makin Airfield (Starmann) on Makin Island at 8:15am piloted by 1st Lt. Karl R. James on a bombing mission led by Lt. Colonel Hanson against Nauru Island. The weather was .1 to .2 cumulus clouds with tops at 8,000'. This bomber was flying in the no. 2 position in the formation. At the start of the bomb run, the formation was targeted by 127mm anti-aircraft guns emplaced on the pinnacles that opened fire with a heavy barrage. Just before bombs away, this B-25 sustained a direct hit in the bomb bay that caused this bomber to leave formation before exploding into two pieces. No parachutes were observed and it was deemed the crew were killed in the explosion or died on impact. 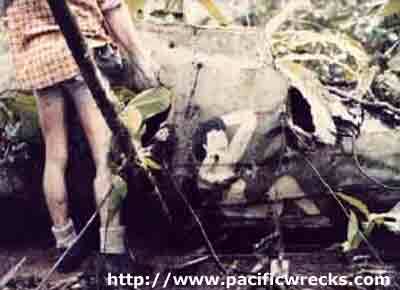 The wreckage was observed to crash into Nauru Island with several secondary explosions observed. When this bomber failed to return, te crew were officially listed as Missing In Action (MIA). "Statement of Sgt Joseph E. McDonough ASN 12050399 – While on a bomb run, 30 June [sic 29 June] 1944, over the island of Nauru, I was sitting by the right waist window watching for flak, which was quite heavy. In my estimation most of it burst off and under our right wing. At this time Lt. Colonel Hanson, over interphone, asked Lt. White the status of the situation at the time. A split section before the question was asked a 127mm shell (to my judgment) burst beneath the bombay [sic bomb bay] of Lt. James' plane taking the after half of the doors away. Evidently that burst struck the bombay tank, causing it to fire. A sheet of flame enveloped the rear section of the plane originating from the bombay. The plane then dipped it's left wing and passed over, and to the rear of our airplane (Number 609) revealing the missing after half of the bombay doors, and the flaming bombay. Just as the distressed plane passed over us, 'bombs away' was heard over the interphone. We peeled off to the right, and at the time the plane in question blew up and separated at approximately the top turret position. The tail assembly floated to the ground, while the forward section descended directly to the earth below. At the time the airplane blew up in the air, the left stabilizer and a few smaller parts broke free, causing a resemblance to persons bailing out. After a few seconds of watching, I realized that what I had seen depart was only parts of the plane. As the forward section of the plane crashed on or just off the island of Nauru several explosions were seen, evidentially caused by the plane's bombs." "Statement TSgt Floyd M. Hooper ASN 20443089 – 30 June [sic, 29 June] 1944, I was flying in airplane number 809, which was the lead plane in a formation of three airplanes. We were making our bomb run on Nauru. The enemy fire was very heavy, and just before our bombs were away the plane flying on our right, number two in the formation, was struck by enemy fire. It was hit in the bombay [sic bomb bay] section, and quickly burst into flames. Plane 977 (which had been hit made a turn to the left in order to get out of formation. About 1200 yards from our formation I noticed the plane turn up on its left wing, and, then blew up. It blew in two different section Both sections were hurled to the island below. The two sections landed on the beach and blew up, with a high column of smoke and fire rising." After the crash, the remains of two of the crew were recovered by the Japanese and buried near the old cemetery but not in it. The entire crew was killed in the crash and officially declared dead the day of the mission. Postwar, the remains of the crew were transported to Hawaii and the United States for permanent burial. Two of the crew are buried at National Memorial Cemetery of the Pacific (Punchbowl). James is buried at Plot P Row 0 Grave 895. Kapla is buried at Plot Q Row 0 Grave 528. Two are buried at Fort Snelling National Cemetery. Keeling at section C-6 site 8329. Stockton at section C-6 site 8329. Jasper section C-6 site 8329. Cheropovich is buried in Erie Cemetery at section 9, lot 721. James has memorial marker at Glade City Cemetery in Blandinsville, IL. After the explosion, wreckage landed near the twin 127mm anti-aircraft gun that shot it down located at the edge of the pinnacles (rocks left over when the phosphate was mined). Some wreckage fell into the diggings and the rest landed elsewhere on Nauru Island. Post war, the war the phosphate mining resumed, workers pushed the wreckage down into the pinnacles making it inaccessible except by climbing through the rocks. At an unknown date, the 75mm cannon was recovered and placed near the beach road. A portion of the nose art (left side, below cockpit) is on display at the Nauru Museum. "Much of the wreckage in the pinnacles had olive drab paint on it. The wing undersides were a pale color, perhaps light blue. I don't believe the Japs recovered any engines from this wreck during the war, it seems they pretty well left it. Even in 1983 there was still one machine gun there and the 75mm. Even ammo and prop blades then. Both engines were still on site the last time I was in there about 1998. There is still one live 500lb bomb at the site. Both wings are in there with the star and bars clearly visible. There are also 25mm hits on the airplane structure. The undercarts/wheels etc are all there and sections of fuselage. The tail was shot off and that came down about half a mile away and was scrapped years ago. I found one complete elevator near where the tail had been. It had a tree growing through it. I cut off the tree and recovered the elevator and now it is in the Australian War Memorial (AWM) together with one of the control wheels. The gun was found by me in the pinnacles in 1983 and some NPC engineers rigged a flying fox arrangement and winched the gun up and then pulled it to firmer ground. It was taken to the mine workshops for cleaning. The breech was got working etc and it was painted. Then it disappeared and I was blamed for pinching it, which I did not. In the late '80s a Nauruan that was married to a white woman passed away and in his garage was the gun! Tony was a relative and he inherited the gun. It was put on that rudimentary base and somebody started taking it apart and retracted the barrel and made a general mess of it. It has sat there by the road ever since. Tony did not want to loan it to the Nauru Military Museum."